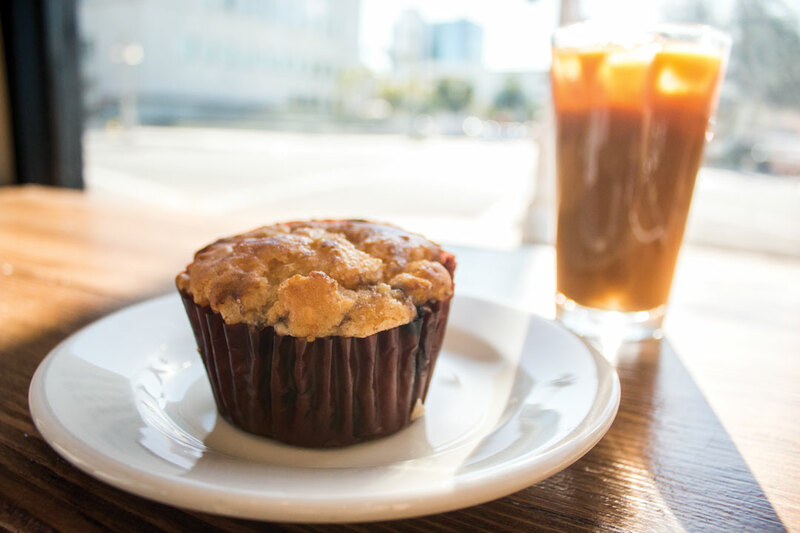 Beehive Bakery Girl has catered affordable gluten-free pastries to coffee shops throughout the Inland Empire since June 2014. Tina Teets started the bakery when she noticed a lack of cost-effective treats for those suffering from gluten allergies like herself. She wanted to be able to join friends in eating pastries when they visited local coffee shops and at church. Most options she found were too expensive or not enjoyable. Ever since she was a child she has enjoyed baking but never expected to have a company without formal training. She was contacted by Augie’s Coffee Roasters pastry account manager within a few months of baking to supply gluten-free pastries for them. The company soon began to expand beyond what Teets ever imagined. When they first began they operated out of a home kitchen but demand increased as they joined Augie’s at their five new locations. This has allowed them to transition to a commercial location. They now supply gluten-free pastries to Restoration Roasters, Sandals Church and Kraemer’s Koffee Bistro. Teets said the company has pulled in the reigns to prevent growing too fast and losing their quality. The bakery’s efforts have helped those with gluten allergies to have one less thing to worry about when going out to eat with friends. “Because I’m gluten intolerant, I felt like a lot of my normalcy had been robbed from me,” Teets said. Stephanie Bell, the Depot lead for Sandals Church, brought on Beehive Bakery for their cafe after a few guests inquired about gluten-free pastries. The bakery’s moist and flavorful pastries received positive feedback from customers after it was introduced. After sampling other vendors, Bell said nothing could compare. “Beehive’s pastries are so delicious that even guests that don’t have an allergy enjoy them,” Bell said. Jessica Burnett, sophomore graphic design major, has enjoyed Beehive Girl Bakery’s treats at both Sandals Church and Augie’s. She discovered her gluten allergy five years ago but is glad to have also discovered Beehive Bakery. “Having gluten free options takes one less stress out of my life and I always appreciate when places have gluten free options,” Burnett said. In the future she hopes to craft a gluten-free baking mix that is cost effective as well as enjoyable. Teets is now working to train her new staff to expand her business and discover new ways to improve. “There is so much love that goes into food preparation, feeding people and the whole beauty of it, I don’t want to miss the good stuff. I still want to do what I love and teach other people to love it as well,” Teets said.